One of the most common questions we receive is "How should I take care of my carpet?" regardless of the quality and the shape of the carpet. Here are some important you need to follow if you want to have your carpet for long years looking attractive. First of all, carpet usually doesn't wear out however its appearance simply deteriorates over time to a degree. The following proper maintenance steps will help reduce the rate at which the appearance of a carpet changes. Using new and good quality underlay under your carpet especially on stairs. Why good quality underlay? Because it is not only giving better resilience underfoot, but can also add to the life of your carpet. Installation carpet on top of carpet is highly discouraged. It is important to have outdoor mats in front of your entrances (front & back) to absorb soil and moisture. This will help keeping the entrances free of dirt and substances, which can be carried in other areas of the house. Mats should be cleaned regularly to prevent them become the source of soil and moist themselves especially during the rainy days. It is recommended to move your heavy furniture occasionally to voice pile crushing. Using Coasters under the legs of tables, chairs and other furniture will help distribute the weight and prevent crushing the pile. If you use any rugs on top of your carpet make sure to remove and clean them regularly. Also, some rugs may fade colour on your carpet and it is important to check whether your rug does the same before replacing our carpet. Prevent exposing your carpet to the sunlight constantly and protect it by blocking with blinds and shades and move furniture periodically to expose all areas evenly. 2) Regular Vacuuming: Vacuuming your carpet regularly is the most important step in caring your carpet. Vacuum frequently and thoroughly especially the high traffic areas. Waling on soiled carpet permits the soil particulars go below the surface pile, where it is harder to remove. Vacuuming frequently removes these particles from the surface before it happyens. Besides frequent vacuum the type of vacuum cleaner is also important on the quality of your carpet care. A good quality vacuum cleaner can clean better than the base model. The use of upright vacuums or quality barrel vacuums fitted with a power driven rotating brush or combination beater/brush bar agitates the carpet pile and mechanically loosens soil for removal by the vacuum. This is the best suited to a low cut pile carpets. To prevent excess fuzzing turn the brush off or change the head when vacuuming loop pile, cut loop pillar berber carpets. A light vacuum is recommended at least twice a week and through vacuum weekly. A light vacuum is classed as 3 passes over and area. A thorough vacuum is 5 to 7 passes over the area. 3) Steam Cleaning: Steam cleaning is required regularly, approximately every 12 to 18 months, depending on the usage and the colour. Steam cleaning should be applied by professionals and shampooing, do-it yourself steam cleaning or dry cleaning of carpets is not recommended. 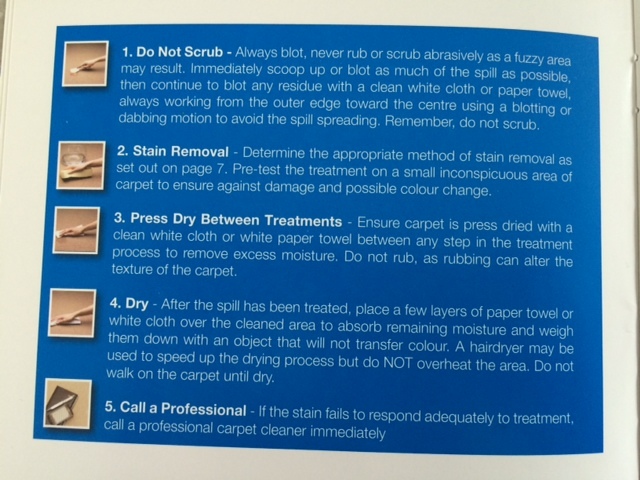 4) Removal pf Spots: In case of spillages immediate attention is required or stains is paramount to avoid penetration of the stain into the carpet fibres and pile and avoid potential discolourration and unsightly markings. Liquids especially if they are must be attended immediately. If the liquid dries or cools the risk of stain increases and becomes almost impossible to remove.